Moles have the potential to ruin your lush-green, meticulously manicured lawn. 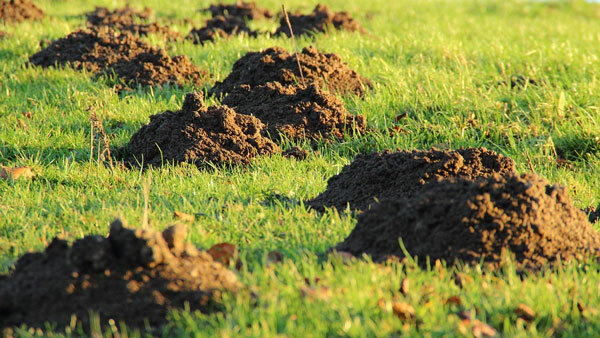 Moles are capable of taking over an entire yard with their extensive tunneling systems.  Mole problems can continue year to year, because they usually come from woodland areas and make their way into a yard. Mole problems are tackled by setting traps in the main tunnel runs, which can be identified as the longest stretch of tunneling coming from the woods. Depending on how many tunnels are present, 5-20 traps may be set on a mole job. 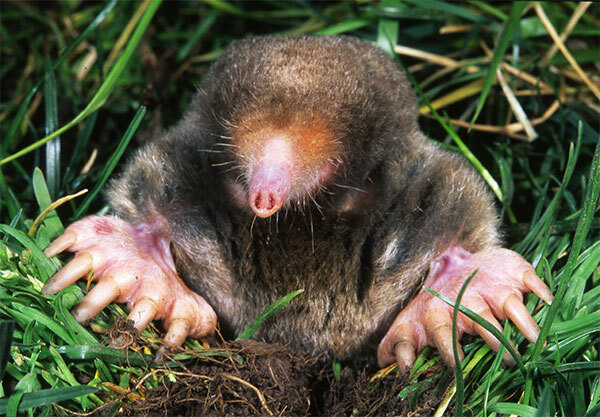 Moles are small mammals that are found all over the world. They are often thought of as garden pests, mainly because of their intricate tunnel systems. And though they spend most of the time underground, they are not blind. Mole damage shows up as long ridges of soil running through the lawn and as volcano-shape mounds of earth called molehills, formed as moles tunnel beneath the soil surface in search of food. You may also notice soil outside tunnel entrances, pushed there while moles construct deep permanent tunnels for nesting and overwintering. Moles are often mistaken for rodents, but they are actually insectivores. Their diet includes insect larvae, spiders, earthworms, and lawn pests such as slugs and grubs. They do not intentionally eat plant material. To meet their high energy requirements, moles eat just about 24/7. They often consume the equivalent of 60–90% of their body weight in a single day and may tunnel 100 feet in the process. Moles are well adapted to the darkness of subterranean living. Nearly blind, they compensate with their keen senses of smell, hearing, and touch. As they dig through the earth with their large, shovel-like forepaws, their tiny eyes are protected from dirt by thin membranes. Their nostrils face to the sides of their pointed snouts to avoid being clogged, and they lack external ears. Moles are insectivores, and their primary diet is earthworms with a few grubs and insects tossed in as appetizers. They don't eat plants, and so their landscape carnage is really the incidental damage of tunnels and runways dug in lawns while on the never-ending search for more worms. 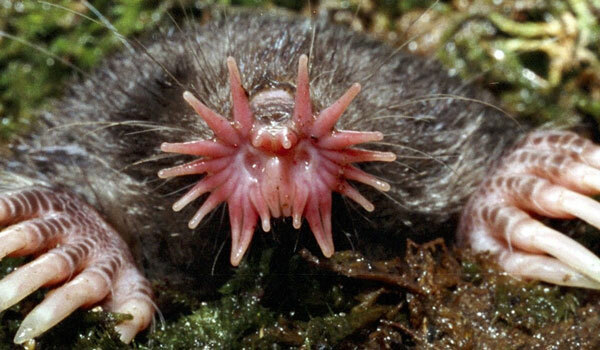 The star-nosed mole is easily identifiable by the twenty-two pink fleshy appendages ringing its snout which is used as a touch organ with more than 25,000-minute sensory receptors, known as Eimer's organs, with which this hamster-sized mole feels its way around. With the help of its Eimer's organs, it may be perfectly poised to detect seismic wave vibrations. These rotund animals have a hairless, pointed snout, small eyes and no visible ears. On average, moles grow to 4.4 to 6.25 inches (11.3 to 15.9 centimeters) long from snout to rump. Their tails add 1 to 1.6 inches (2.5 to 4 cm) of length. They typically weigh 2.5 to 4.5 ounces (72 to 128 grams), according to the Mammal Society. The American species is a little on the larger side. The North American mole species tends to get as big as 7 inches (17.6 cm) long, 1.25 inches (3.3 cm) tall and weighs around 4 ounces (115 grams), according to the Internet Center for Wildlife Damage Management. Moles are found on every continent except Antarctica and South America. They live in grasslands, urban areas, gardens, grasslands, sand dunes, mixed woodland or any area that has soil where they can dig tunnels. They do tend to stay away from areas with acidic soil and mountainous areas, though, according to The Young People’s Trust for the Environment (YPTE). Moles use tunnels to travel, but tunnels are more than just underground highways. Moles dig special chambers at the ends of tunnels that serve as bedrooms and birthing areas. Sometimes moles will live in a series of tunnels for generations before moving. Moles have kitchens, as well, in tunnel chambers. They eat mostly earthworms, and keep them alive and immobile by biting their heads, and then store them in the chamber. As many as 470 worms have been recorded in one chamber, according to the Mammal Society. Moles spend most of their lives alone and underground in their tunnels. Moles are such loners, in fact, that three to five moles per acre (7 to 12 hectares) is considered a lot, according to Internet Center for Wildlife Damage Management. Moles spend their time digging tunnels and hunting for food. A permanent tunnel is usually about 2 inches (5 cm) in diameter and 8 to 12 inches (20 to 30 cm) below the surface, while temporary tunnels are usually right under the surface of the ground. It is a misconception that moles burrow into gardens to eat the roots of plants. They are actually after the earthworms that are found in garden soil. Moles love earthworms so much that they eat nearly their body weight worth of earthworms per day. For example, a mole weighing 2.8 ounces (80 g) eats around 1.7 ounces (50 g) of earthworms per day, according to the Mammal Society. Moles also consume insect larvae. During breeding season, males will enlarge their tunnel to more territories to find females to mate with. Once the breeding is done, a spherical nest chamber lined with dry plant material is created. A female mole gives birth to three to four hairless babies at a time. By 14 days old, the mole babies, called pups, will start to grow hair. At four to five weeks, the pups are weaned, and at 33 days they leave the nest. By five to six weeks, pups leave their mother and their home tunnel completely. Moles typically live three years, according to YPTE.